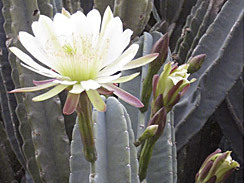 Like all cactus, the Peruvian Apple cactus’ buds and fruit are edible. Its gorgeous big showy white flowers make it a very popular ornamental plant. 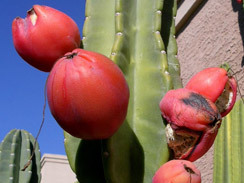 You can harvest the young buds for pickling with tomatoes and yucca buds. Or wait 2-3 more months when the buds will have turned first into flowers, then finally into red lemon-shaped fruit. 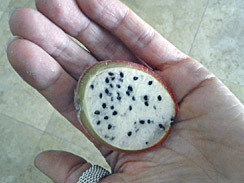 The fruits’ interior looks very much like Dragon Fruit, having sweet white flesh scattered with small black seeds throughout. The fruit exterior is smooth, without spines or stingers. 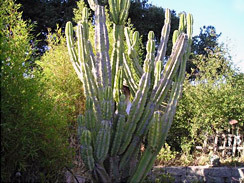 This cactus is also referred to as Cereus Peruvianus and Hedge Cactus. Eat the fruit raw and fresh. Cut fruit open lengthwise and scoop flesh out with a spoon. You can eat the seeds with the fruit. The taste is not as sweet as prickly pear, but nice, and the texture is lovely and firm. The seeds give it a nice bit of crunch but are not too hard to chew. For marinated Peruvian Apple Cactus buds, see my recipe below for Marinated Yucca Bud Salad, combining tomatoes, yucca buds and cactus buds.